A few hours after Julianna was born my sister in law brought Josselyn to the hospital to meet her brand new baby sister. Josse did not act at all like I had imagined! She looked very confused when we introduced her to the new baby. 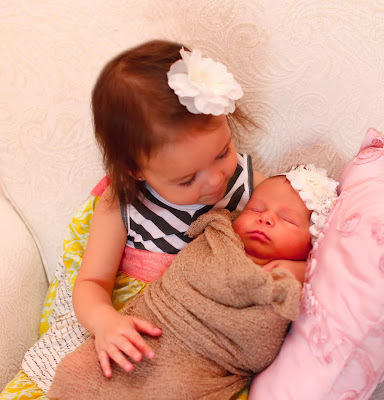 Josselyn was not quite 20 months old and to be honest I don't think her brain even understood what it meant when we all kept saying, you are a big sister now! Josse crossed her arms and glared at the baby as we brought her over. We thought that letting Josse hold the baby would fix everything, but Josse didn't even really enjoy holding the new baby at first! After holding Julianna for about 10 seconds she quickly said "all done baby". Josselyn was pretty confused the entire time I was in the hospital. She couldn't sit in my lap like usual and I couldn't hold her when she said "mommy hold you". Although she loved having her PaPa & GiGi babysit her while I was in the hospital, it was still unusual for Mommy & Daddy not to be there to tuck her in at night and get her up in the morning. Josselyn was not sure that she liked what she saw! I figured things would get better once I was released from the hospital & we were in our own house. To my surprise things only got worse the first few weeks at home! Josse had no idea why I wasn't able to hold her (for 6 weeks) or get out of bed for a couple days (a c-section recovery is no joke!) I made sure to have Josselyn come get in my bed and read books together everyday, but she was still not getting the attention from mommy that she was use to. I thought Josselyn would warm up to baby Jewel in a day or two but that did not happen! Whenever Josse got in bed with me for story time she would say, "bye bye baby" or "baby go night night" and point to Julianna's bassinet. All of a sudden everything of Julianna's became Josse's. Josselyn would take the baby's pacifier, blanket or burp rag and say "that's Josse's" and hold it close. Josselyn now wanted a pacifier (even though she refused to take one the entire 1st year of her life). She wanted to lay in Jewel's Nap Nanny chair or play mat and she wanted to be covered up with Jewel's blankets, not her's. I could some what handle Josselyn's sudden regression and possessive attitude but what I could not handle was the crazy aggression that came out of now where!!! Out of now where Josse began trying to hurt poor baby Jewel! Josselyn has never been one to hit, pinch, scratch etc but all of a sudden that changed. In the first week that we brought baby Julianna home, Josse scratched her face, pinched her arm & hit her on the head with an iphone (which left a bruise). Now these were not accidents...how do I know? Well, one of the times Josse was sitting on my lap rubbing baby Jewel's arm when all of a sudden she says, "ouch". I was confused why she said "ouch" until I saw her pinch the fire out of Jewel's arm a split second later!!! She actually premeditated the pinch!!! Jewel started crying, then Josse started crying and then I started crying! We pretty much had to watch Josselyn like a hawk and keep a good distance between her and the baby for about 8 weeks! Luckily, sometime during the last 3 weeks Josselyn has decided to completely STOP trying to hurt her sister and instead, she now likes to give her the pacifier when she cry's, cover her up with a blanket when she sleeps and help me burp "pat" her after she eats. I am so thankful for the sudden change of heart Josselyn has had towards her little sister. It absolutely melts my heart that Josselyn now gets concerned when baby Jewel begins to fuss or cry. The other day Jewel was crying and Josse looked at me and said, "Baby Jewel MaMa's chi chis" basically that meant breastfeed the baby ASAP mom! haha I can now rest easy knowing that big sister no longer wants to afflict pain on baby sister. So needless to say, we have had an interesting 12 weeks with our little girls full of up's and down's. Josselyn went from being an only child to a big sister and that is not an easy transition, especially when you are only 1 year old! I am sure that she had a flood of little emotions that she could not process and did not understand in her little one year old brain. I think a lot of her acting out had to do with wanting attention, more than not liking our new little addition. Who would want to have to start sharing the spot light when you had it all to yourself for 20 months. 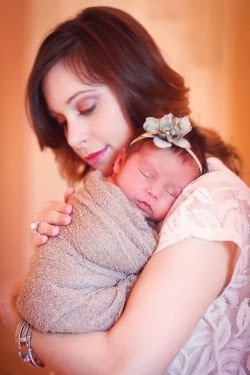 I am just glad that it only took about 2 months for Josselyn to adjust and she now adores "her baby Jewel".